The Company Inn is based in the large and imposing Trent Navigation Company warehouse on the north bank of the Nottingham Canal, the one that you can see from the bridge crossing that has the big British Waterways sign on the top. It is the last in the line of pubs that span that stretch between the Station street bridge crossing and the Wilford Street Bridge crossing. I will be honest and say that I do favour the other pubs in the line; Fellows, Morton and Clayton pub, and the Canal House above the Company Inn, Even Via Fossa has its merits with the Cask Bar. The main reason that it comes fourth on my list it that it is just another Wetherspoons pub. Now I have already conceded in the past that they do have their place and do keep open pubs and places that might have closed down. My only real reason is that it is the same menu everywhere and when I walk into somewhere looking for some food I do like to get a little bit excited that there may be some nugget of joy on there to tantalise my taste buds. So it was with a little soulless joy that I opened up the menu at the Company Inn on this day. I had the Brunch Burger which based on it’s list components ‘should’ have been a winning dish. The menu describes it as the Brunch Burger-6oz beef burger, with mature cheddar cheese, bacon and a fried egg, with chips”. Well that ‘Sounds’ fine enough and that is why I ordered it, as I was in the mood somewhere between breakfast and a burger. In the end it was a curious matter. A stack so high that it needed it’s own scaffolding in the form a of long wooden skewer. There was so much air floating around in the gaps I didn’t know if it was a burger or some sort of Jenga kitchen game to see how high we could build without a collapse. Conceptually there is nothing wrong with this burger, in reality it was a bit of an epic fail. It cam far too quickly from the kitchen, that may sound strange but I am not even sure that there was long enough for the sound of the microwave ping to reach the ears. It was almost as if someone had just assembled the tower from a selection of pre-pre-prepared ingredients. Now I am not daft enough to not realise that in a busy kitchen on the line that is pretty much how it works, but at least wait a while and give us an illusion that someone has lovingly crafted my dish. What did I like about this burger? well I liked the fact that it filled me up, I liked the fried egg, and I liked that it was better than my mates Club Sandwich. 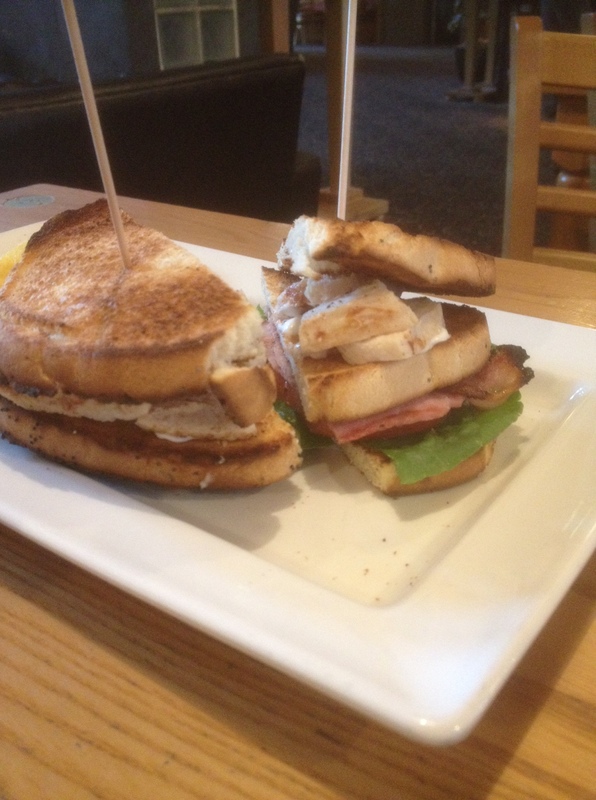 the Club Sandwich was a bit of a sad affair, ok if you really just wanted a sandwich to fill you up, but not amazing if you had your heart set on a glorious tasty snack from the Club sandwich family. It had most of the components that you expect, a reasonable amount of bacon and white meat (possibly chicken, possibly turkey). Someone had even managed to take the toast to the brink of being burnt, impressive stuff, even more impressive that no-one had suggested that perhaps they should start again after all the toast breaded is quite a major feature in a perfect club sandwich. We were not fans of this dish here on this day, but we know it can be better as we have had better in other members of this chain in the past. Perhaps it was just not our day. The Company Inn is next to the canal and served beer, lager, wine and other alcoholic beverages. They have a fair range of real ales and ciders on the bar. If you want food we somewhat reluctantly would suggest walking back along the canal to the Canal House or to Fellows, Morton, and Clayton.